Diane Jacobsen is among the sharp-eyed collectors, like Leonard Lauder and the late Andy Williams, who see value in things others might overlook. Who would collect chairs? Everyone has dining and sitting room chairs, but on first glance it seems hard to explain the 53 chairs purchased over the last half-dozen years by Diane Jacobsen. Her chairs rarely match. Quite the opposite – they range from an early 19th century ladderback doll's chair to a laminated birch bench, shaped like the capital of an ionic column and fabricated in 2010 by Brooklyn-born artist Laurie Beckerman. In between are chairs designed by John Henry Belter, Herter Brothers, Frank Lloyd Wright, Eero Saarinen and Frank Gehry, among others. And Jacobsen is still buying. Her latest catch? A bentwood side chair made by Samuel Gragg around 1815 with his patented "elastic" process for bending strips of wood with steam into chair components. Louisa May Alcott may have sat there: the chair bears the monogram of her aunt Mary May Davenport. Include Jacobsen among the sharp-eyed, idiosyncratic collectors who see value in amassing a group of things that others might overlook. Leonard Lauder, the cosmetics king who owns what many consider to be the best group of Cubist paintings in private hands, is also a lifelong collector of postcards. He started buying them at about age 6, credits them with turning him into an art collector, and has purchased more than 150,000 over the years – most of which are promised to the Museum of Fine Arts in Boston. "I am an incurable collector," he says, adding "The thrill for me is the hunt." Eugene V. Thaw, whose collections of Native American art and Old Master drawings have graced the galleries of several museums, also saw art in staircase models. Created by cabinetmakers in England and France in the 18th and 19th centuries to demonstrate their skills, these wooden marvels were shown at and donated to the Cooper-Hewitt National Design Museum a few years ago. Thaw has collected in other niche areas, too, like bronzes from the Russian and Chinese steppes just before the Christian era. "I'm not interested in following the crowd," he says. "I'm interested in the object and learning about them, and I learn by owning and looking and studying them." Decades ago, long before others gave Chinese furniture much thought, Edward "Ned" Johnson III, the founder of Fidelity Investments, was buying it. Others have seen treasure in antique American flags (financier Morris Offit), mechanical pencils (attorney Jonathan A. Veley) and Navaho blankets (the late singer Andy Williams). Often these collectors simply fall in love with an item, then another, and then another, almost accidentally. Jacobsen is a prime example. In 2004, she was helping to organize an exhibition to honor her late husband at the Cummer Museum of Art in Jacksonville, Florida, where she has a condo near the beach. Already a collector of American paintings and decorative arts, she noticed in a dealer's notebook an "Egyptian Revival Side Chair," made circa 1875 of ebonized cherry wood. "I knew so little at the time that I asked, 'Is that American?' and he said yes," she recalled one recent day over tea in her Fifth Avenue apartment in Manhattan. Enchanted by the image of a sphinx on its back and its scroll legs, she asked to see the chair in person. She bought it, and put it into the Cummer exhibition. The same dealer showed her a "Peacock Feather Chair," designed by the Wakefield Rattan Company, from 1885. She bought that, too, and added it to the exhibition. Then came a revelation. "Children were mesmerized by the chairs," she said. "They were drawing the chairs. I said, 'this is a way to teach people about American art.' " As a collector, Jacobsen is amassing what she calls a "teaching collection," one that explores and explains the United States through its art. Her chairs dovetailed neatly with that effort. Jacobsen had a similar epiphany after she bought a few more chairs. "I had them scattered around the apartment in Florida, and people would come and talk about the chairs and not my masterpiece paintings," she says. "That's when I really started to think, There's something here. This is our history." Now, Jacobsen believes that chairs "show our ingenuity better than anything." 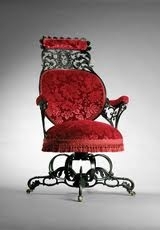 As an example, she cites her "Texas Longhorn Arm Chair," which was created by Wenzel Friedrich around 1890. 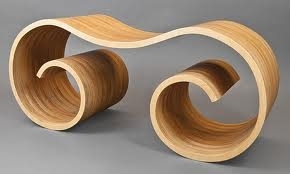 At the time, steer horns were typically discarded, but Wenzel saw that they could make fanciful furniture. 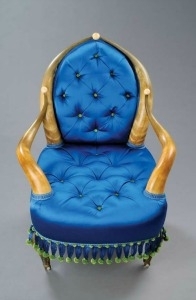 Not at all rustic, his chair is upholstered in tufted royal blue satin and accented with bright green tassels. It sits on delicate feet made from Tiffany glass. Once hooked on chairs, Jacobsen, a self-described Type A personality with a Ph.D. in international relations, set out to research them, visiting museums like Winterthur and the Metropolitan Museum of Art, talking with curators, reading books, and perusing auction catalogues. She enlisted help from Andrew Van Styn, a Baltimore dealer and art consultant who is now the director of acquisitions for her chair collection. "My friends thought I was nuts," she says cheerily. "They said, 'Why chairs?' until they saw them. Then they were amazed." Others have been, too: Since January 2011, 43 of her chairs have been on tour in a popular exhibition called "The Art of Seating: 200 Years of American Design." It is now on view through May 19 at the Telfair Museums in Savannah, Georgia, and it's booked at other museums through mid-2015. At first, she says, "I was going to match the period of my paintings," about 100 years from the early 19th to the early 20th centuries. She and Van Styn made a list of targets – the important styles and important chair-makers – and he scouted for them. But the more Jacobsen learned and looked, the more her eyes wandered. When she saw the famous chair from about 1938 designed by Frank Lloyd Wright for the headquarters of Johnson Wax in Racine, Wisconsin, she had to have this marvel, made of tubular steel painted "Cherokee red" and upholstered in the same color. "Now I'm outside my timeframe," she explains. "But the innovation of this chair attracted me." The chair was on the auction block in Chicago, but Jacobsen didn't bid high enough. "After the auction, I was heart-broken," she says. "I called the auction house and the expert said he had another one, which I bought." Though she is coy about disclosing prices, the Wright chair is her most expensive chair – it cost about $70,000. With that purchase, she decided to expand the timeframe of both chairs and paintings. For a while, she kept the chairs in her home. Sometimes that proved problematic. "I didn't want people to sit on them," she says, "but some people, immediately, plopped down on them. Once, a heavy fellow sat on one, and I shouted out 'No!'" Now, those chairs that are not on tour are either on loan to the Columbia Museum of Art in South Carolina or at her foundation offices. Yet her home is where the exhibition got started. Deborah Broder, then director of the Museum of Contemporary Art in Jacksonville (and formerly director of development at the Cummer), was visiting Jacobsen one day. As Jacobsen tells the tale, "She saw them and asked 'What are all those chairs?' " When Jacobsen said she collected them, Broder implored her to do a show and didn't flinch when Jacobsen pointed out that antiques might be out of place in a contemporary museum. Instead, Broder sent a curator who suggested that Jacobsen "expand her collection to contemporary.' "
She agreed. "They helped me fill in the gap from 1940 to 2010," she says. "So we had a flurry of buying." They sought out chairs by the likes of Harry Bertoia and Isamu Noguchi, plus those by living artists like Robert Venturi and Vivian Beer. 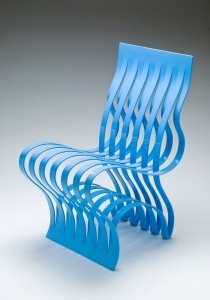 "I loved it, because for contemporary chairs, I went to meet with the artists. That was a whole new world. It was the best." Taken as a whole, the chairs present a journey though the aesthetic trends of American furniture for 200 years, with the added dimension of showing new technologies and evolving thoughts on ergonomics. "I won't stop yet, but now it has to be an exceptional chair," Jacobsen says. "What I covet most is a klismos chair," a sloping, curved-back Greek-style revival from the early 19th century. The Metropolitan Museum has one, dated 1815-20 and attributed to John Finlay. "I haven't been able to find one that I can afford – the last one I saw was $500,000," she says. "I don't have a ceiling, really. I could have done it – and I still don't know if I made the right decision." Benjamin Weiss, the Leonard A. Lauder Curator of Visual Culture at the Museum of Fine Art in Boston, oversees "ephemera of all sorts"– artists' archives, postcards, posters, trade cards, advertising flyers, documentary photos and the like – the very things enterprising collectors might spot as their own. What's new at the museum in this area? We just acquired a collection of scrapbooks of Japanese matchbook covers. We got it from a Japanese dealer, but we have no idea who the collector was. They are incredibly beautiful, and were probably collected in the 1930s. What else has intrigued you lately? I went to visit a man who collects Japanese toy robots from the 1970s and '80s. And I know a collector with a stupendous collection of Victorian scrapbooks. The Metropolitan Museum exhibition ["Playing with Pictures: The Art of Victorian Photocollage" in 2010] showed the upper end; these were more do-it-yourselfer things – they are sly folk art. There's a huge collecting community for ocean liner ephemera – photos, postcards, cruise brochures, cutaway diagrams of the ships. How do these collectors get started? It happens in every way you might imagine, sometimes at flea markets. The robot collector just fell in love with one that he saw, and now he has 1,000 of them. Some were shown at the Louisiana State University museum a few years ago. How would you advise would-be collectors? You have to follow your passion, and not be embarrassed by what you find beautiful and fascinating and compelling. People worry that what they find compelling is not serious enough. That is the wrong impulse. I know someone who collects coat hangers – he has a wall filled with the most wild variety of designs and shapes. How does a would-be collector educate him- or herself? Things made in the 20th century are easier to research. For the 19th century, it's much harder and there are no price guides. But a lot is not expensive. And some things will have bulletin boards [online] and even newsletters or publications.